or scroll down this page to see them all. While the stators, rotors, and rather computer-controlled electronics are all commercially available, they can be more expensive than many some modest-aperture telescopes. Initiative member Dave Rowe devised a very low cost, axial flux, direct drive motor for telescopes. Normal direct drive motors are radial flux motors. 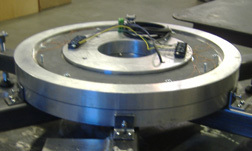 The radial �one ring inside another� configuration is energy efficient, but involves an expensive arrangement of magnets, coils, and soft steel to contain the flux. Rowe realized that energy efficiency was not important for modest aperture alt-az telescopes, and devised an axial flux motor, with a simple coil ring placed on top of a permanent magnet ring. The axial flux direct drive motor only cost about $300 per motor in magnets, wire, and steel, and is extremely easy to build. The axial-flux direct drive motor devised by Initiative member Dave Rowe. An 18-inch diameter motor was readily assembled from parts and materials that cost only $300. The azimuth assembly on the right includes the motor, bearings, and high resolution tape encoder and read head. AC Synchronous Servo Motor Controller Direct-drive, direct-position-reading servo systems are much more difficult to control than ordinary brushed DC motors, and require not only high resolution on-axis encoders as inputs, but high-speed, computation of the control system filters a feedback algorithm. 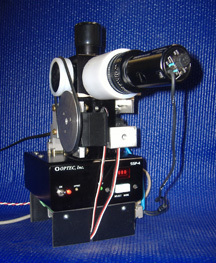 Initiative member Dan Gray at Sidereal Technology designed a low cost control system that handles two �brushless,� AC synchronous, direct drive telescope motors. Gray also wrote all of the real-time, embedded firmware for the controller, and the PC-based command-and-control software. The low cost direct drive servo motor controller devised by Initiative member Dan Gray. An on-board microcomputer performs the requisite trigonometric and other calculations at high speed to control the current through the motor�s coils. Spherical Corrector One of the early conclusions of the Alt-Az Initiative was that one approach to keeping mirror costs and weight down beyond 1 meter aperture was to utilize multiple spherical primary mirrors. For instance, four 0.75 meter primary mirrors have an equivalent aperture of 1.5 meters, while four 1.0 meter mirrors are equivalent to 2.0 meters, quite a respectable research telescope. Telescopes with spherical primaries and instruments at prime focus are of special interest to Initiative members not only because spherical primaries are relatively easy to make but, more importantly, because a number of smaller spherical primaries can be grouped together to form a much larger spherical primary�one that could potentially weigh and cost less even when one considers the complications of multiple mirror alignments. The catch, of course, is that the individual mirrors need to be tip-tilted with some precision, and very significant spherical aberration needs to be corrected. While aspheric secondary mirrors, such as Pressman-Carmichael, could be employed, a lower cost (albeit narrower field of view) approach is a refractive corrector with the instruments at prime focus. Dave Rowe designed a two element, all spherical surface, prime focus refractive corrector for an effective 1.5 meter, f/3.5 telescope with a single spherical primary mirror or multiple primary mirrors. Corrected Dall Kirkham Dave Rowe designed the optics for a 0.7 meter (28 inch) corrected Dall Kirkham optics for a telescope with a Nasmyth focus. This design employs a spherical convex secondary mirror that is much less sensitive to alignment errors than non-spherical secondaries. The two-element refractive all spherical surfaces corrector provides a wide, crisp field with generous back focus. This optical design is being incorporated in the telescope that will be produced by PlaneWave Instruments. This optical design and the Corrected Hyperbolic Newtonian (CHN) design below were developed by an automated ray-tracing program, Darwin, which Dave Rowe developed. As with biological evolution, random variations are introduced and the best results from each generation are allowed to propagate, while less favorable variations fall by the wayside. Dave has been known to run a design problem through Darwin for a week or two on a high speed PC. 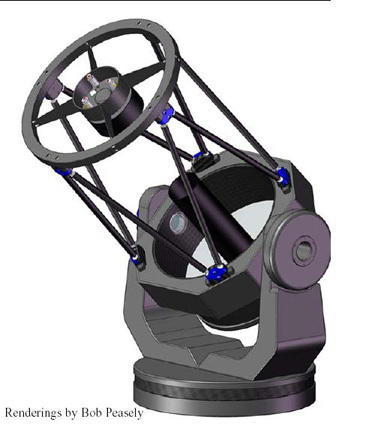 Corrected Hyperbolic Newtonian Initiative members Dave Rowe and Tong Liu designed an optical system for Corrected Hyperbolic Newtonian (CHN) telescopes. Their CHN design combines a generous back focus (not readily available with parabolic primary correctors) with a wide, crisp field of view. Their initiative concentrated on the design and production of a two element, all spherical surfaces, refractive corrector. A convenient focal length was chosen that resulted in alt-az telescopes with a convenient eyepiece/instrument height. Corrector lens sets are available from Hubble Optics as are matching lightweight hyperbolic primary mirrors. Both large mountaintop alt-az telescopes and their diminutive lowland brethren share a common obsession with lightweight primary mirrors. Without lightweight mirrors, telescope weights and hence costs rapidly get out of hand. For small telescopes, especially in the 1-2 meter aperture range, transportability and assembly are vital issues if 18-wheelers and cranes are to be avoided. Initiative members have been addressing the challenges of lightweight yet low cost primary mirrors for small alt-az research telescopes from several perspectives. Foam Glass Mirrors Several Initiative members have been investigating the use of foam glass as lightweight spacer/structural material between the top and bottom glass plates of a primary mirror. Pittsburgh Corning makes Foamglas, a rigid insulating material used in LNG ships, many industrial applications, and even under heated concrete runways in cold climates such as Alaska. Andrew Auregema has been machining concave surfaces in the tops of Foamglas blocks, while David Davis has been slumping and fusing glass plates to Foamglas in his kilns. Attendees at the recent Galileo�s Legacy conference in Hawaii were intrigued when David pointed out that Foamglas sandwich mirrors float on water. He then proceeded to toss a Foamglas mirror blank on the floor without damage. Soda lime Foamglas comes in a number of densities, and there is also a low coefficient of temperature expansion borosilicate version of Foamglas. Initiative member Andrew Aurigema machined the top surface of Foamglas� material from Pittsburgh Corning. David Davis then fused thin glass plates to the Foamglas to form a lightweight mirror blank. Initiative members are investigating the use of low shrinkage adhesives to fasten pre-slumped top plates (and flat bottom plates) to Foamglas cores as an alternative to kiln fusion. A group in Italy under the direction of Giovanni Pareschi is also working on Foamglas mirrors, and the Director of Development at Pittsburgh Corning, Steve Badger, has been generously supportive of these Foamglas mirror developments. is achieving success with this approach. Polyurethane Replica Mirrors Initiative member Kiran Shah is experimenting with polyurethane replica mirrors. These mirrors have a solid polyurethane front surface supported by a dense polyurethane foam body that is formed in a mold. 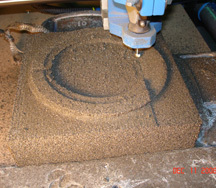 A concave master is pressed against successive thin layers of solid polyurethane until its surface is a reasonable inverse replica of the master. This work is highly experimental, and Kiran does not expect high optical quality. 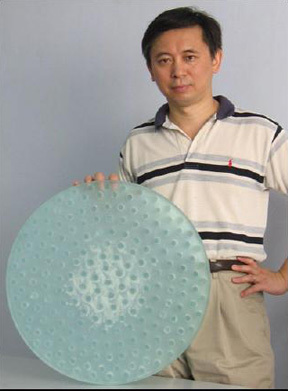 However, the cost to make these mirrors in volume could be extraordinarily low, and thanks to their very light weight, a number of spherical replica mirrors could potentially be assembled into a multiple mirror telescope with an instrument and refractive spherical corrector at prime focus. The �instrument� might consist of a near infrared photodiode, a high speed photodiode, or a fiber feed to a low resolution spectrograph. Meniscus, Sandwich, and Cast Mirrors David Davis has been experimenting with slumped meniscus mirrors. He builds his own kilns and does his own grinding, polishing, and figuring by machine. Both low cost float glass and Pyrex have been slumped. Work is also continuing on the development of sandwich mirrors with glass spacers (Tong Liu at Hubble Optics), and with cast mirrors with glass honeycomb backing structures (Cary Chelborad and Allan Keller at Optical Structures). Initiative members Mel Bartels and David Davis are both interested in seeing how far thin, slumped meniscus mirrors can be �pushed� with respect to both aperture and thinness. Soda lime or borosilicate float glass can only be procured in thicknesses up to 25 mm. As apertures of meniscus mirrors this thin increase, however, an aperture will eventually be reached where, similar to the situation with mountaintop alt-az telescopes, corrective forces under computer control will need to be applied to the primary mirror if it is to retain its proper figure as the telescope changes its altitude and hence the gravity vector acting on the mirror. Voice Coil Active Primaries In a visit to the Gemini North eight meter telescope, Initiative members discussed the Gemini�s �voice coil� active mirror support system with Chris Carter, then Gemini�s control system engineer (Chris recently joined the Thirty Meter Telescope developmental team). 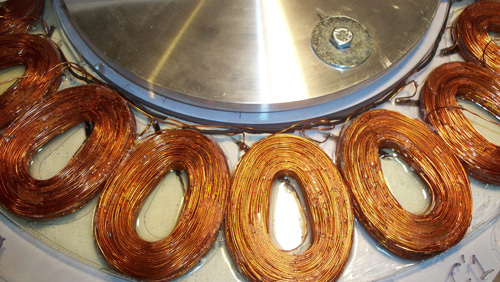 Chris suggested that for smaller telescopes, a voice coil support system to �tweak� the mirror into proper shape as altitude changed could be made at low cost. Two undergraduate electrical engineering students at California Polytechnic State University are now developing low cost electronic controls for voice coil meniscus mirror adjustment. They are also, in a parallel effort, developing the electronics for small stepper motor mirror tweaking. 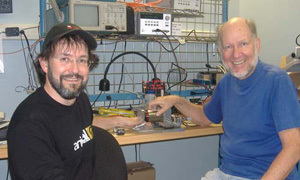 Chris Carter and Russell Genet examine one of the Gemini�s spare voice coil actuators used to maintain the shape of Gemini�s actively corrected primary mirror. Chris suggested that active mirror support would be a good tech transfer candidate. Stepper Active Primaries The Cal Poly electrical engineering students are also, in a parallel effort, developing the electronics for small stepper motor mirror tweaking. In both cases, the concern is only for very low frequency (less than once per second) adjustment of the primary mirror to correct for the lowest order Zernike terms, especially astigmatism. 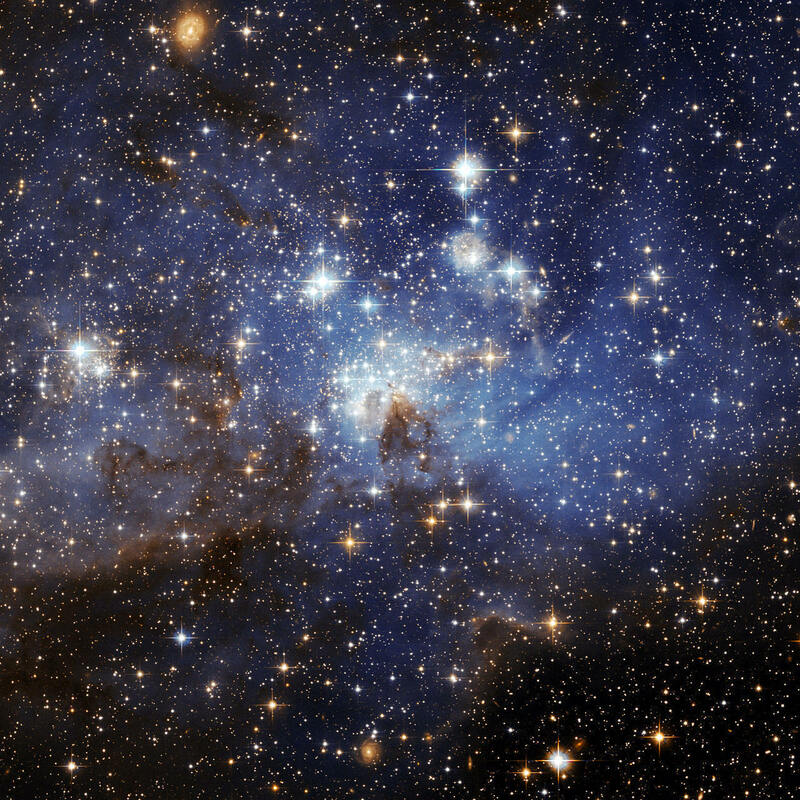 The requisite adjustments can, we believe, be made �off line� on a number of bright stars distributed in altitude with a coefficient determination algorithm that minimizes the spread of the stellar image. During operation, the current altitude of the telescope is noted, and the required settings interpolated from a lookup table. This approach is used by the eight meter Subaru telescope with recalibration of their table only required about once a year. Bely, Pierre Y. 2003. The Design and Construction of Large optical Telescopes. Modern Techniques. Corrected 2nd printing 2001. Berlin: Springer. Semi-passive Bimorph Mirror Correction This initiative is just getting underway. The objective is to provide corrections as a function of telescope altitude to compensate for optical distortions introduced from flexible mirrors or mirror support structures. It is hoped that such corrections can be provided at low frequency (less than once per second) via interpolation of correction coefficients determined off line and occasionally updated. Semi-passive bimorph mirrors are not expensive, and such correction might provide a low cost alternative to heavier mirrors or mirror supports. Finally, there is a third approach we are considering for active optical correction, and this is the use of a semi-passive bimorph mirror. These mirrors consist of two thin disks, one of active piezo material coated with a thin layer of conductive metal on each side, and the other a thin front surface mirror. The two disks are bonded together with a low shrinkage adhesive. 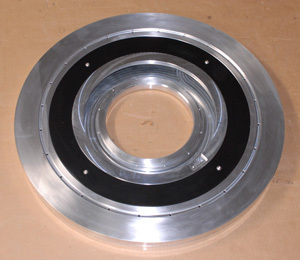 The back metal coating on the piezo disk can be divided into sections. When a high voltage (100 to 350 volts) are applied to the sections, the piezo materials in each section contracts or expands some amount, depending on the applied voltage and its polarity. The combination of these expansions and contractions can warp the thin mirror disc in a modal manner. A computer controls these voltages through a digital-to-analog converters and high voltage operational amplifiers. Initiative member Greg Jones� low cost, semi-passive bimorph mirror. Instrument Clusters One of the Alt-Az Initiative�s members, Gary Cole, has been focused on the concept of developing lightweight automated science instrument clusters to maximize the number of available observing modes on a single telescope. This in turn multiplies both the research and educational value of the facility. Instrument cluster developed by Gary Cole. Permanently mounted, yet remotely switchable instruments increase system versatility and, compared to mounting and demounting instruments, greatly reduce the costs of operation and maintenance. The core of this project has been the development of a programmable, lightweight, 4 way instrument selector that can tie together, both optically and mechanically, a complete suite of science instruments including the new 50mm CCD cameras. This device is just now entering production from Optec, Inc.
Left, 3-D drawing of the lightweight programmable instrument selector that will be offered by Optec, Inc. Right, bench testing of the lightweight instrument cluster prototype. As an example, the prototype 20 pound cluster provides: target acquisition, imaging, Sloan band photometry, deep R~400 survey spectroscopy, R~10000 spectroscopy, JH band infrared photometry, and broadband dual beam imaging polarimetry. The selector and instruments operate as IP network devices. The data is gathered in FITS formats. A single laptop operates the entire cluster along with the telescope under the control of an automated observation scheduler. Assuming a typical 1000 hr/year observing program and five year lifetime, the amortized cost of this instrument cluster is less than 5$/hour. The range of both research and education opportunities provided by an instrument cluster such as this one on a 1 meter platform is very exciting. JH Band Photodiode Photometer Automation Currently, near infrared imaging cameras remain quite expensive ($50K and up) because these cameras cannot be fully implemented in silicone chips alone, requiring a hybrid combination of materials. While efforts are underway to reduce the cost of these cameras, a much lower cost, and easier to handle option for JH band near IR photometry is available in Optec�s SSP-4 photometer for only $3K. The SSP-4, developed by Optec, in cooperation with the American Association of Variable Star Observers, is ideally suited for observing long-period Mira and other variable stars. Initiative member Dan Gray has automated the filter changing and flip-mirror functions of the Optec SSP-4 to allow fully automatic operation. 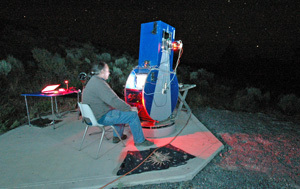 Dan and Initiative member Russ Genet made a test run on this modified SSP-4 at the University of Oregon�s Pine Mountain Observatory in July 2008. Dave Rowe analyzed the resultant data. 14-inch alt-az telescope (right) in a test run at Pine Mountain Observatory. Cal Poly 18 The modest aperture (18 inch) Cal Poly 18 (CP 18) alt-az telescope was designed and built not only as a technical demonstration, but also for eventual use by student researches at California Polytechnic State University. The telescope�s drive system has no gears, belts, or friction wheels; instead, as described earlier, direct drive motors and high resolution encoders are completely integrated into the bearing assemblies and telescope�s structure. In altitude, for instance, a ring of permanent magnets is firmly mounted to the OTA while an opposing ring of coils is mounted on the inside of a fork arm. The electronic control system has been designed to operate these brushless motors in a high precision mode. 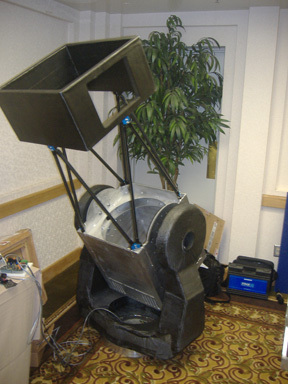 The Cal Poly 18 alt-az telescope designed and built by Initiative members, including undergraduate students at California Polytechnic State University. Final fabrication and assembly was completed at Sidereal Technology in Portland. On the right are the coils for the altitude direct-drive motor. To achieve the highest possible closed loop servo bandwidth, the structure was designed�by Cal Poly students using finite element analysis as well as traditional analytic tools�to have an unusually high natural frequency. 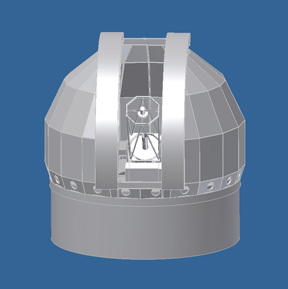 The direct drive system and stiff structure effectively counters wind gusts when such a telescope is operated out in the open or within a roll-off roof observatory. 1.5 m Telescope Challenge To provide focus to the Alt-Az Initiative, it was decided, less than a year into the Initiative, to provide a challenge�one that was difficult enough to inspire the innovative application of technology, yet not so difficult as to discourage a wide range of efforts to meet the challenge. The Alt-Az Initiative Challenge needed to be specific, so a number of Initiative members developed the Challenge over a Friday evening dinner on May 23rd, 2008, at a Restaurant in Big Bear, California, right after the Society for Astronomical Science�s (SAS�s) annual conference and at the start of the annual Riverside Telescope Maker�s Conference (RTMC). 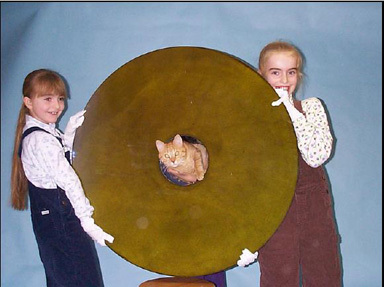 (1) A primary mirror diameter of 1.5 meters or larger. (2) Multiple primary mirrors bringing light to the same focus, where the area of the multiple mirrors was the same area (or greater) as that of a 1.5 meter single mirror, i.e. an equivalent area. Phase coherence not required. For example, four 0.75 meter spherical mirrors could bring light to an instrument at prime focus. (3) Multiple OTAs on the same mount with, again, a combined area equivalent (or greater) than that of a single 1.5 meter mirror. For example, a 4x0.75 m �four shooter� telescope might provide simultaneous BVRI photometry. Optical Quality The goal of the Alt-Az Initiative is to promote the development of telescopes and their use in scientific research programs. The dinner group felt that an optical quality sufficient to support a dedicated research program such as fiber-fed spectroscopy or near infrared photometry would meet the challenge. 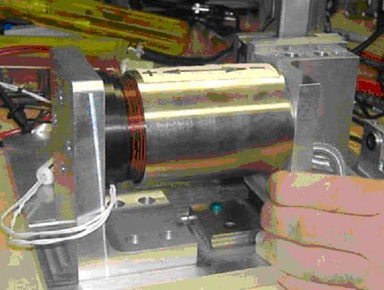 To be more specific, the group chose the �easiest� useful scientific mission we could think of, and this was J-H band near infrared photometry with an Optec SSP-4 photometer. The SSP-4 has a �one pixel,� on-axis photodiode detector that is 1 mm in diameter. We specified in our challenge that 80% of the light (at 1.2 and 1.6 microns) would need to fall within a 0.4 mm (400 micron) diameter circle at the telescope�s focal plane. Such a dedicated, 1.5 meter, time series, NIR photometric telescope with this detector could make scientifically useful observations of late-type pulsating stars, eclipsing binaries, etc. Of course even higher optical quality was hoped for, but we did not want to set the bar so high that it would discourage innovative solutions that, over the course of time, could be further refined. Cost, Weight, and Transportability Although not formally defining either low cost or lightweight, the intent of the Challenge was to encourage the development of alt-az telescopes that would be affordable not only to smaller institutions to encourage undergraduate student research, but would even be affordable to many individual amateur scientists. A crane would not be allowed for assembly, and when disassembled the telescope would have to fit in the back of a generously proportioned pickup truck or U-Haul type trailer. Million dollar budgets, eighteen wheelers, and cranes would be disqualifying. Time Limit and Demo Requirements To provide a time frame, the challenge window only extends until Friday evening, May 25, 2012�four years Friday-to-Friday from the date the Challenge was issued. Challenge telescopes must be brought to one of the May Riverside Telescope Maker�s Conference via an �ordinary� vehicle or trailer (no 18 wheelers), set up by a few individuals with ordinary hand tools (no cranes), and must make some scientifically useful observations. Telescopes brought in a similar manner to conferences anywhere on the planet will also be appropriately considered. PWI CDK 700 Telescope Construction has begun at PlaneWave Instruments by Initiative members Rick Hedrick and Joe Haberman and their associates on a production, 0.7 meter, corrected Dall Kirkham telescope with Nasmyth foci. The telescope employs direct drive motors and control system electronics and software that are similar to and based on the Initiative�s experience gained with the Cal Poly 18 demo telescope described above. The PlaneWave Instruments CDK 700 telescope. The Nasmyth configuration facilitates instrument changes without rebalancing, and also provides a convenient height for visual observing. 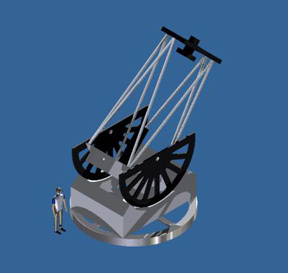 Shown is an overall telescope drawing. A Nasmyth optical configuration with two foci (optional second focus) was chosen to place instruments and eyepieces at a convenient height, to make the telescope insensitive to even large changes in instrumental weight (counter weighting is not required), and to minimize the telescope�s moment of inertia in altitude. The corrected Dall Kirkham (CDK) optical system, designed by initiative member Dave Rowe, was chosen for its wide, well corrected flat field, generous back focus, and its relative insensitivity to secondary mirror lateral misalignment (the secondary mirror is spherical). The CDK 700 azimuth drive assembly is more than a motor. It is a 3 phase 24 volt AC direct drive torque motor, with an integrated high resolution encoder, and an integrated 22.5� bearing. This assembly is both the base of the telescope and the drive. 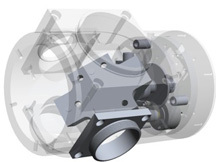 On the left is a drawing of the assembly that illustrates how compact it is, while a piece of the assembly being machined is shown on the right. The 28-inch primary is relatively easy to manufacture, as is the 11-inch spherical secondary. The two-element corrector employs all spherical surfaces. The well corrected field supports the largest commercially available CCD sensors available today, and should continue to do so well into the future. 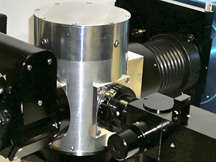 The large, flat field is very useful for a variety of off-axis guider configurations. CDK 2.5 Meter Telescope As an off-shoot to the Alt-Az Initiative, Caisey Harlingten and Craig Breckenridge are developing a higher-end 2.5 meter alt-az CDK telescope to be used at the university level. Borrowing many ideas presented elsewhere in this paper, the goal is to produce a singular design that can be produced in volume in order to lower manufacturing costs. The 2.5 meter CDK telescope (left) and low cost enclosure (right). Remote operation is a key feature of the overall design. The initial design includes the direct drive motors, dual position tertiary mirror, and Alt-Az concept with field rotators discussed elsewhere. The design is based on an optical configuration by Dave Rowe. Caisey and Craig plan to make telescopes more affordable for universities by utilizing a flat field of view and focal length that provides a good compromise between telescopes used for discovery and follow-up research. The design follows their philosophy of efficient thermal and mechanical design coupled with an equally efficient enclosure design. Both telescope and enclosure are designed to be operable remotely. The initial prototype for this telescope will start production in the fall of 2009.